Celebrate the cherry blossoms on April 16 and 17 with the new Blossom Barge – an innovative floating installation of 36 flowering cherry trees. It’s going to depart Tymac Launch Service near Crab Park at 8.30am on Saturday morning, and will take a route past Canada Place, Stanley Park, English Bay, and Granville Island to Science World, before returning to Granville Island Market to moor at Dock 7. Between 12-2pm there will be a mini festival of free performances at Granville Island Market, including Tetsu Taiku & Tzo’kam collaboration, Langley Ukulele Ensemble, Kutapira, Chibi Taiko, and the international yoyo superstar – Harrison Lee. Since opening at 1141 Robson Street at Easter time, the celebrated French patisserie Ladurée has been incredibly popular with Vancouverites who can’t wait to taste the famous macarons. Canada’s first Ladurée Boutique and Tea Salon takes its design inspiration from the rich history of Ladurée, which goes back to 1862 when Louis Ernest Ladurée, a man from the southwest of France, opened a bakery on 16 Rue Royale in Paris. Cherish a taste of the cherry blossoms with a limited edition cherry blossom flavoured macaron ($3 each). We love Miku and Minami and absolutely adore the special sakru sushi that they have this spring, in addition to their blossom flavoured desserts such as Cherry Pistachio Terrine (Miku) and Sakura White Chocolate Mascarpone Cheesecake (Minami). Look out for the Miku Sakura Roll ($19) by Chef Hayashi, which features marinated sockeye salmon, hotate, cucumber, and asparagus wrapped in seared kanpachi and shiso. It is then topped with golden tobiko and a salted sakura flower. We also love the Minami Sakura Roll ($18) by Sushi Chef Hiroshi Hoshiko, which features shiso-infused shari, creamy snow crab, spinach, and asparagus all wrapped with kanpachi and topped with sakura denbu, sakura salt, and raspberry purée. We also love the cherry blossom inspired cocktails to match, like Miku’s Mountain Dream with Momokawa Pearl Sake, honey elderflower syrup, lemon juice, and apricot brandy foam. Are you feeling Lucky? 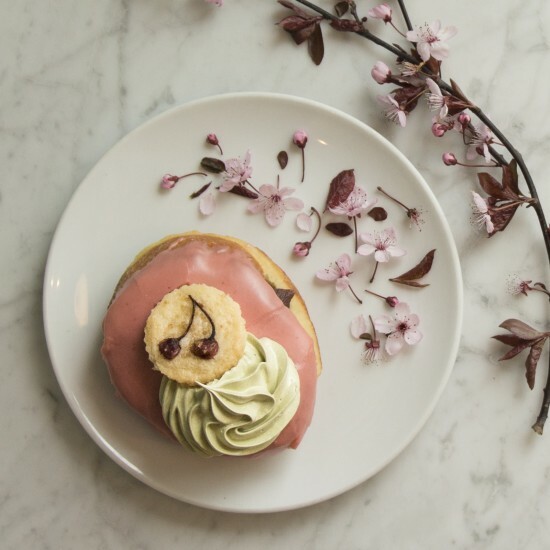 If you manage to get one of the limited edition Sakura doughnuts from Lucky’s Doughnuts at 49th Parallel Café (Main Street or Kits) then you certainly will be! The classic Bismarcks are infused with cherry blossoms and filled with sweet red bean paste: a strawberry sakura glaze, dollop of matcha meringue and sakura-blossom shortbread cookie top the tasty treat ($5).